Happy Monday! I've been wanting to write a post about what I have been up to lately because this semester has been jam packed and going by so fast. I can not believe that there are less than two weeks until spring break! 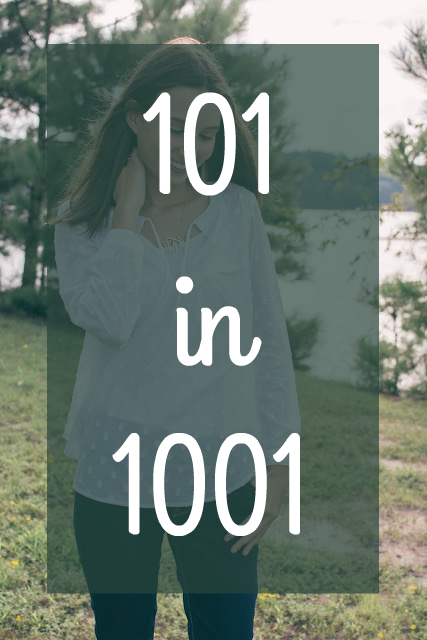 If you missed this post then you may not know that I joined a sorority! I have been absolutely loving it. 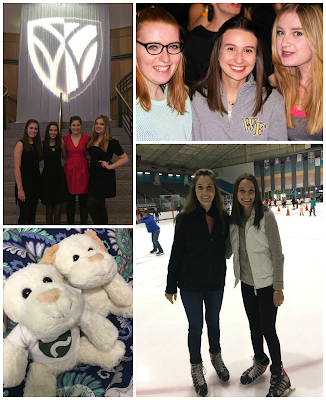 It is so great to always have so many fun things to do and so many great sisters to do them with! One of the big things we had was our first date function, it's called Red, Kite, and Blue and is American themed. It was so fun to get dressed up in red, white, and blue in February and dance the night away with some friends! The other big thing that we had was big little reveal. 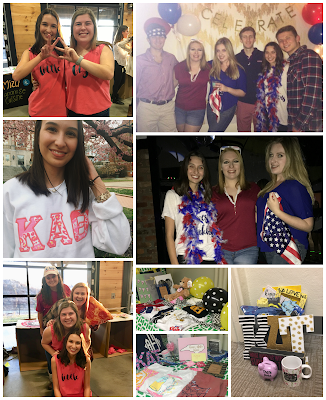 I got a week full of great gifts and an even better big on Friday at reveal. I may not have been surprised at reveal, but it didn't make it any less exciting and fun! But I've also enjoyed the little things like movie nights and eating yummy food. But I guess the most exciting thing is that I was initiated last Sunday, so I am officially a member of Kappa Alpha Theta. I'm so thrilled with my new sisterhood and can't wait for so many great memories to come! I have the greatest parents and sister because they are always putting in the time and effort to come and visit me! My dad came up about 2 weeks ago for the Wake vs. Duke game. The game did not end well(Wake lost in like the last 30 sec), but it was fun to get to hang out with my dad! And then this past weekend my whole family came to visit. I was so excited to see everyone, but especially my sister since she had just passed her driving test! 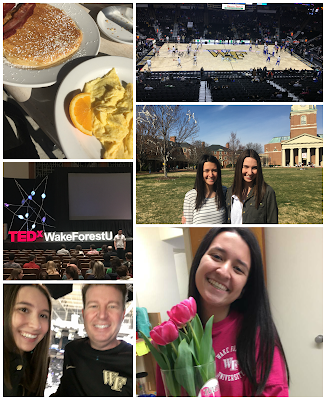 We had a lot of fun going to the Ted talk that Wake Forest had, going to see a Dog's Purpose, and eating some yummy food. I miss them already but am so excited to see them in just two weeks for spring break! I've been trying to really enjoy doing things with friends this semester. I've been loving all the spontaneous off-campus dinner and ice cream runs! 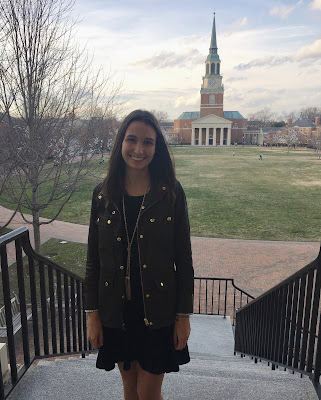 A couple weeks ago some friends and I attended a Wake Forest event called Wake Frost. It was a really fancy party, and we loved getting to dress up and eat some super tasty food. It was a really great change of pace from the usual frat party. I've also really loved going to basketball games! Some friends and I went to the Wake vs. NC State game, it was my first time sitting in the student section at a basketball game and I had so much fun standing and cheering on the Deacs! We also made it on the big screen and it's safe to say that moment made me want to crawl under a rock haha. Then this past weekend a friend and I went ice skating! It was so fun and definitely a really good work out. It was something fun to do off campus and I'm already itching to go back! Then later that night we went to another school sponsored event called, aWAKE All Night. It was a fun event with games and food, but more importantly, a fun station where you get to stuff your own bear! I'm not really a stuffed animal person, but even I could resist these adorable puppies. I have also been absolutely loving the weather lately! It's been in the 70's so many days and I've loved pulling out the sandals, dresses, and tank tops. I have no problem with spring coming a little bit early this year! I hope you all enjoyed this look in to my life. I've really been trying to live my life to the fullest and create memories in everything I do! Let me know what exciting things you've been up to lately.